Teaching Hospitals Hit Hardest By Medicare Fines For Patient Safety : Shots - Health News Medicare will cut payments to hospitals with high rates of patient infections and injuries. Half of the nation's academic medical centers will be docked for making too many medical mistakes. 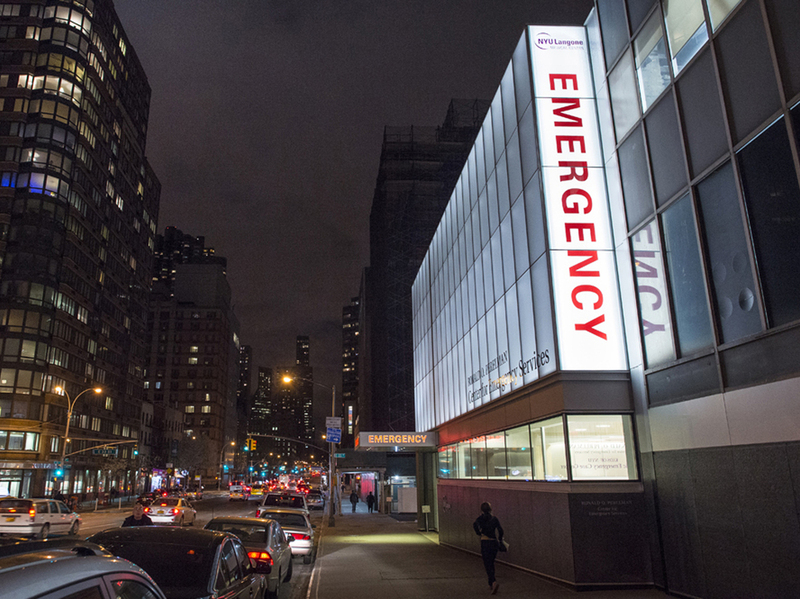 NYU Langone Medical Center is one of the teaching hospitals being penalized by Medicare for its rate of medical errors. Medicare has begun punishing 721 hospitals with high rates of infections and other medical errors, cutting payments to half of the nation's major teaching hospitals and many institutions that are marquee names. Intermountain Medical Center in Utah, Ronald Reagan UCLA Medical Center in Los Angeles, the Cleveland Clinic, Geisinger Medical Center in Pennsylvania, Brigham and Women's Hospital in Boston, NYU Langone Medical Center and Northwestern Memorial Hospital in Chicago are all being docked 1 percent of their Medicare payments through next September, federal records show. In total, hospitals will forfeit $373 million, Medicare estimates. The federal health law required Medicare to lower payments for the quarter of hospitals with the highest rates of hospital-acquired conditions, or HACs. These avoidable complications include infections from central-line catheters, blood clots and bedsores. The penalties come as hospitals are showing some success in reducing harmful errors. A recent federal report found that the frequency of mistakes dropped by 17 percent between 2010 and 2013, an improvement that Health and Human Services Secretary Sylvia Burwell called "a big deal, but it's only a start." Even with the reduction, 1 in 8 hospital admissions in 2013 included a patient injury. Dr. Eric Schneider, a Boston health researcher, said studies have shown that medical errors can be reduced through a number of techniques, such as entering physician orders into computers rather than scrawling them on paper, better hand-washing, and checklists on procedures to follow during surgeries. "Too many clinicians fail to use those techniques consistently," he said. The quality penalties have "put attention to the issue of complications, and that attention wasn't everywhere," said Dr. John Bulger, chief quality officer at Geisinger Health System, based in Danville, Pa. However, he said hospitals like Geisinger's now must spend more time reviewing their Medicare billing records as the government uses those to evaluate patient safety. The penalty program, he said, "has the potential to take the time that could be spent on improvement and [spend it instead] making sure the coding is accurate." Hospitals complain there may be almost no difference between hospitals that are penalized and those that narrowly escape fines. "Hospitals may be penalized on things they are getting safer on, and that sends a fairly mixed message," said Nancy Foster, a quality expert at the American Hospital Association. The penalties come on top of other fines Medicare has been levying. With the HAC penalties now in place, the worst-performing hospitals this year risk losing more than 5 percent of their regular Medicare reimbursements. About 1,400 hospitals are exempt from penalties because they provide specialized treatments such as psychiatry and rehabilitation or because they cater to a particular type of patient such as children and veterans. Small "critical access hospitals" that are mostly located in rural areas are also exempt, as are hospitals in Maryland, which have a special payment arrangement with the federal government. In evaluating hospitals for the HAC penalties, the government adjusted infection rates by the type of hospital. When judging complications, it took into account the differing levels of sickness of each hospital's patients, their ages and other factors that might make the patients more fragile. Still, academic medical centers have been complaining that those adjustments are insufficient given the especially complicated cases they handle, such as organ transplants. "To lump in all of those things that are very complex procedures with simple things like pneumonia or hip replacements may not be giving an accurate result," said Dr. Atul Grover, the chief public policy officer of the Association of American Medical Colleges. Medicare levied penalties against a third or more of the hospitals it assessed in Colorado, Connecticut, Delaware, Nevada, New Jersey, New Mexico, Rhode Island, Utah, Washington and the District of Columbia, a Kaiser Health News analysis found. A separate analysis of the penalties that Dr. Ashish Jha, a professor at the Harvard School of Public Health, conducted for Kaiser Health News found that penalties were assessed against 32 percent of the hospitals with the sickest patients. Only 12 percent of hospitals with the least complex cases were punished. Hospitals with the poorest patients were also more likely to be penalized, Jha found. A fourth of the nation's publicly owned hospitals, which often are the safety net for poor, sick people, are being punished. "I've worked in community hospitals. I've worked in teaching hospitals. My personal experience is teaching hospitals are at least as safe if not safer," Jha said. "But they take care of sicker populations and more complex cases that are going to have more complications. The HAC penalty program is really a teaching-hospital penalty program." You can download the full list of hospital penalties here.